It’s that magical time of year and for all you foodies out there it means one thing – Christmas markets. Ireland is becoming more and more of a foodie heaven and we’ve picked the best markets during the festival season for you to enjoy. 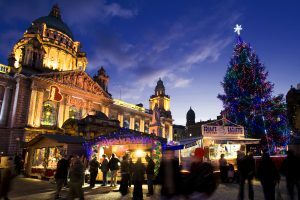 Belfast’s iconic Christmas market has been a focal point in the city for well over eight years and is becoming more popular each year. With a magnificent backdrop of the historic Belfast city hall, the market attracts traders from all over Europe and Ireland who proudly display their crafts, beers & food in an authentic German style log cabins. Enjoy the sights and smells of this bustling continental village, as you sample many of the mouth-watering treats on offer. Italian nougat, Belgian Chocolate, freshly made French patisseries, as well as meats from all over the world are some of the many foods on offer. Enjoy a glass of mulled wine, a hot cider or a warming mug of hot Glühwein while you watch the world go by and sample the perfect burger or hot dog! This truly is a food lover’s paradise. Galway, Ireland’s most famous & popular town embraces the Christmas spirit as its centre, Eyre square is transformed into a magical wonderland. Festooned with twinkly lights and an enormous Christmas tree, the square is packed with shoppers and traders enjoying the vibrant festive atmosphere. The whole family are catered for with a variety food and sweet cabins, workshops for the kids and of course visits from Mr Claus himself. Santa’s Grotto takes centre stage amongst more than 50 beautifully decorated wooden stalls. This year the fair will host a large amusement section with a big wheel lighting up the Galway skyline. An airport hangar in Sligo Airport is the unique home of Strandhill’s Christmas market which takes place every Friday & Sunday in December. With up to 20,000 people expected, the festive spirit is high in Hangar 1 this Christmas. Step inside out of the cold and wet to a beautifully decorated space tranformed by local artists into a Christmas wonderland. With a variety of local produce including vegan & vegetarian options, it’s no wonder this little market is getting international recognition. There are a wide variety of stalls on offer, selling Christmas delights, local artists’ crafts and homemade goods, making it the perfect place to find a unique gift for that special person. Sit back and enjoy the festive cheer, with carol singing, hot chocolate and mulled wine and with a visit to Santa himself, this really is a magical family day out. 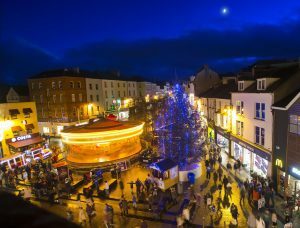 Cork city is set alight by a 30 metre high Ferris wheel giving you the best view of Cork City you could ever imagine this Christmas. Grand Parade is the home of ‘Glow’ a bustling Christmas market with food stalls ranging from traditional hot dogs, spiced beef to sweet treats and hot chocolate; the perfect place to get into the festive mood. Take in the festive atmosphere with trees twinkling with coloured lights and the vintage carousel which turns to the tune of favourite Christmas favourite carols sung by Cork’s finest carol signers. Jack Frost pictured at Glow, A Cork Christmas Celebration. 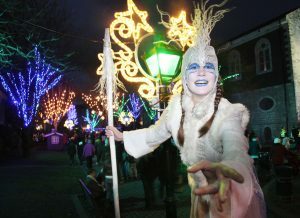 Ireland’s oldest city transforms into Winterval, an action packed festival with events that the whole family can enjoy. See your favourite characters in ‘Waterford on Ice’, visit Mr Clause in Santa’s grotto and stroll through the beautiful craft market in the heart of Waterford’s Viking Triangle. Be sure to stop off at the giant post box where all the children can post their letters to Santa. Food stalls line the streets serving sweet treats, mulled wine and all the hot food one would find in a traditional European market. If it all gets a little too much or you want to add to the adventure head over to Barronstrand street and hop aboard the magical Winterval express, a road train that takes you by all the sights and events.